Author’s edit in 2017: who would have known that one full year after this Euro Trip, I would move to the outskirts of Paris to attend a semester abroad at France’s elite business school, HEC Paris. The school was just 8km from Versailles and I would frequent the palace and its nearby cafes to study for exams. Life is truly beautiful! I woke up this morning at 8am and hurried to get ready because of what awaited me just 30 minutes out of Paris: Château Versailles! But first, of course, we had to stop for breakfast crepes and cappuccinos at the Café down the block from our hotel. My delicious Parisian breakfast on my first day in Paris. To begin to explain how decorative and overwhelming the Château is would take hours. But envision this, everything that you’ve seen in your history textbooks is propped right in front of you, as every inch of it as elaborate you could imagine. Walking up the cobblestone pathway, I felt the history seeping from the walls of the château. Every room served a unique purpose (oft seeming repetitive, rather symmetrical) and was orchestrated by one of the many reigning kings of France. But to walk within the château and hear the history behind it all was truly such a valuable experience. 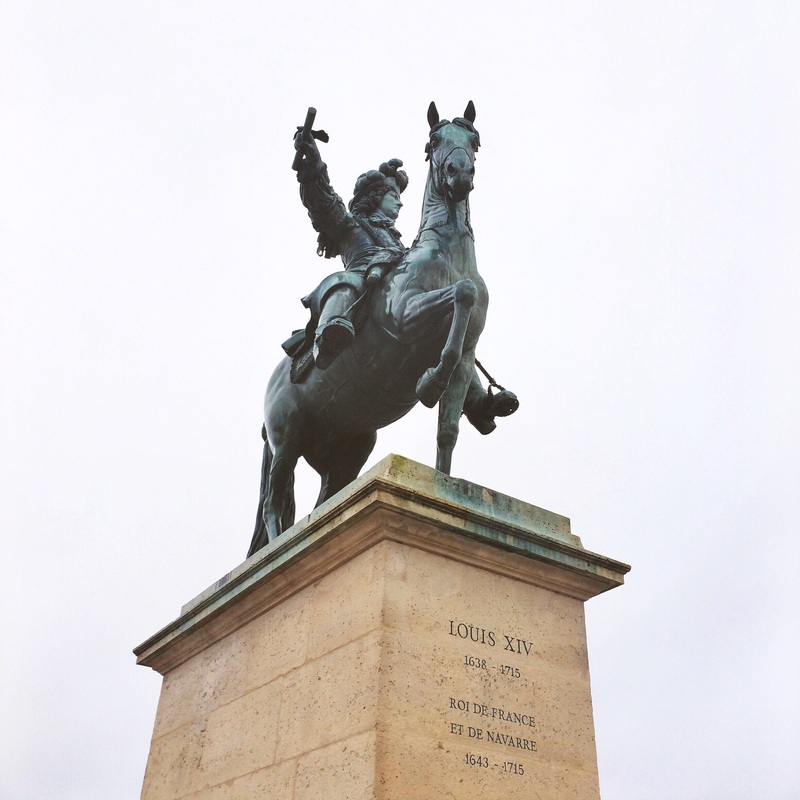 Louis XIV’s statue outside the gates of Versailles Palace. In all of my history classes, I’ve always had a fascination with the French Revolution, and Versailles is home to its beginning, with the storming of the château. While walking through Marie Antoinette’s bed chamber, I learned of her timely flee from the château as it was stormed by angry mobs. Here, Marie escaped through a secret door in the chamber. I also greatly admired the delicate and elaborate panneling in all of the rooms, each bearing the image of the sun, King Louis XIV’s emblem. Completing my tour of the Palace, I walked down through the jardins, breathing in the smell of the juniper trees and crisp winter wind. As I imagined how it was during the time of the French monarchy, I felt history come alive all around me. I would highly recommend visiting the Palace, as it’s something I will cherish forever. Inside the majestic hall of mirrors in the Palace. As I was leaving Versailles, my friend noticed a Tex-Mex restaurant at the corner of the street. Not even a Mexican restaurant, but TEX-Mex. In the middle of VERSAILLES, of all places. I spent the evening enjoying the company of my friend’s family’s home in Northern Paris for traditional fondue and champagne. Now it’s 2 am and I’m laying on my bed as I type this out, only dreaming of what tomorrow will bring. Looks like heaven! You are blessed. You write so beautiful and the description is so well written ; I feel like I was there with you. You put feelings into your writings and it makes it even more special. A big thanks and Bon voyage.